Artists that use Adobe Photoshop may be aware that the Actions Command allows a person to do repetitive tasks by recording a series of commands that can be used for batch processing of files or for one image at a time. But they may not be aware that Photoshop makes it even easier to use Actions by creating droplet applications with those actions. 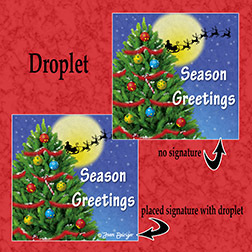 A droplet is a mini application that can be saved anywhere on the computer or even shared with other artists that use the same or later version of Photoshop. When a single or group of images is dragged onto the droplet, the droplet launches Photoshop and starts applying the action to each of the images. This is a great way to speed up workflow and avoid boring tasks in doing the same repetitive steps on numerous images. Read "Creating Droplets" to learn more about droplet apps. 1. Change the file(s) size and/or format. 2. Edit images (apply drop shadows, patterns, textures, text, etc.). 3. 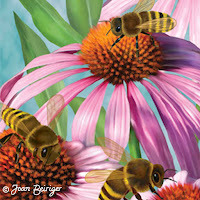 Place the copyright symbol and signature on the images. 5. Add image(s) to a contact info page for submission to manufacturers. Read and view "Bulk Image Compression with Photoshop Droplets" (simple step-by-step tutorial and a video showing how to convert files with the Actions Command and droplet). View "Create Droplet in Photoshop" (video on re-sizing images with the Actions Command and droplet). Sometimes when you are doing batch processing with the Actions Command, you need to pause the action. For instance, you may want to pause the action to change the title of the image on a submission page. To find out two ways you can pause the action, read "Can I have a Photoshop action pause itself to wait for user input?" That action can than be made into a droplet. When using the droplet, it will pause so that you can change the title with the text tool. And then, when you press Okay the action will continue. Droplets have been reported that they stop working when they were created with Photoshop CS3, or CS4, or CS5 and the Macintosh operating system was upgraded to Lion. To find out more and how to fix the problem, read "Droplets don't work | Photoshop CS5, CS4, CS3 | Mac OS X 10.7 (Lion)". It's so handy having so much info on your blog, Joan. It's a "droplet" of it's own. Thank you. Joan, this is a life saver. THANK YOU. Great tip Joan. It surely saves a lot of time, especially when dealing with a lot of images.